It was late 2012 when a completely new and traditional Indian dress made its way into each and every girl’s wardrobe. This design was loved so much that even designers worked around it so much so that each and every Bollywood biggie owns this regal attire. I am talking about what is called “the Indian ball gown”, the very versatile Anarkali suits. Even if you own many suits your wardrobe is incomplete without this one piece of Indian attire. The best part about Anarkali suits is that that they appeal to woman of every age and body type. And nowadays everyone is experimenting with the designs and patterns in this wonderfully traditional and versatile Anarkali suits. If you are looking for the new and popular design for your Anarkali suits but are doubtful if it suits your body type, then you are at the right place. Here are some very versatile Anarkali suits that are ideal for all body types. It is not surprising to find one of the most stylish statements of the year has made its way to be a part of your Anarkali suits. You can take a simple Anarkali with no work on it and add on an embroidered jacket of any length to it and TA-DA your new and fabulous attire is ready to rock. Note: it is not necessary that you go for an embroidered jacket, you can also go for Jaipuri styles jackets or denim jacket. Layers became a rage after Sanjay Leela Bhansali’s “Padmavat” not only in lehengas or sarees but also our versatile Anarkali suits. They look so gorgeous that you can even include them in your wedding trousseau as well. Just dot go for too many layers. Only two layers give the best bounce and effect. 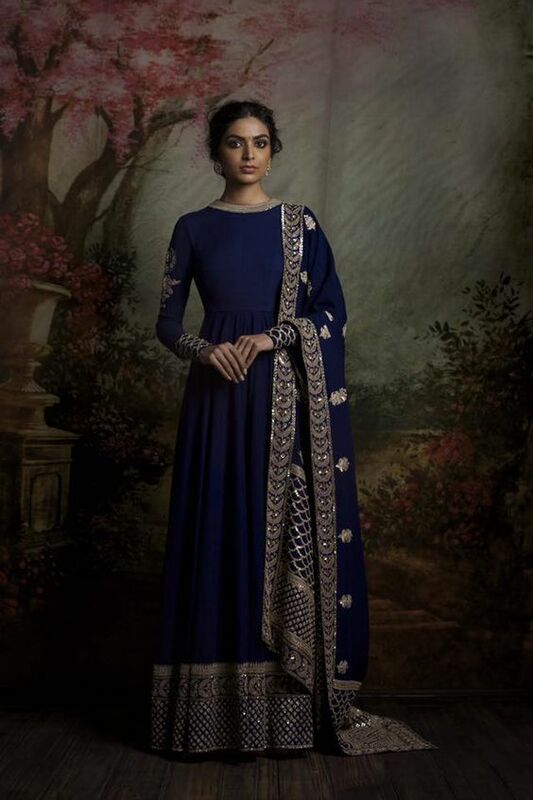 Traditionally an Anarkali started off being the length of a kurta that is knee length but with time the Anarkali stretched to ankle or floor length giving the look of a gown but more traditional. This style of versatile Anarkali suits looks regal and gorgeous making it one of the most popular one among the ladies. Cuts and slits have taken over the market this season. And to say the least, these slits looks awesome on Anarkali. You can opt for a single side slit or slit on both the sides it will still up your style game. This trend is gorgeous, perfect and royal. When you are not looking for something completely traditional but a little western is when printed Anarkali makes its way to your wardrobe. It’s fashionable, beautiful, and western yet it comes into the category of versatile Anarkali suits. Don’t forget to go for subtle colors like pastel shades and a floral print. One of the most trending patterns in Anarkali is the cape style Anarkali. 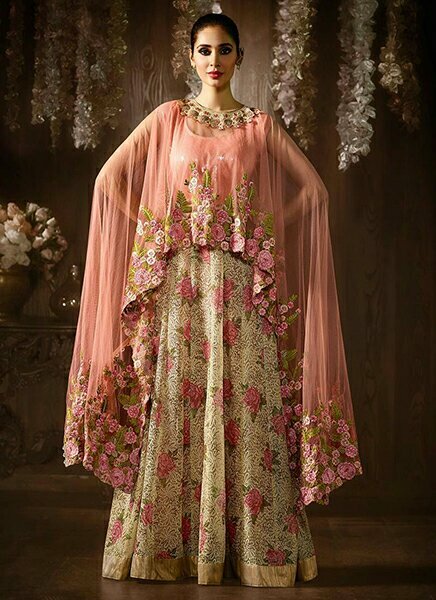 In this design, you can go for a simple floor length Anarkali and top it off with a heavy net cape of the same color. It will look gorgeous and make you feel like a princess. Just remember to accentuate it with heavy danglers or a mang tikka and you are ready to slay. It happens sometimes that you want a heavy Anarkali, if you are one of them then you can go for this Anarkali. It is completely embroidered, from the top to the bottom. But even in its heaviness, this one looks utterly outstanding. Anarkali suit is one such piece that can be worn at any event whether it is a religious occasion, wedding events or even on regular basis. They are here to stay forever and we are not complaining.